WHAT CAUSES IRREGULAR TRUCK TIRE WEAR? Replacing your truck tires is one of the regular expenses to be expected when operating a commercial truck. Irregular wear, however, can force you to replace truck tires early and waste money. You should be aware of the most frequent causes of irregular tread wear and tire failure while driving and maintaining your rig. That way, you can do everything within your power to keep wear to a minimum and safely go for longer without replacing your tires. You need to make sure you’re using the right commercial tire for the position and application. Running highway tires off road or choosing the wrong tread for the job can lead to fast and irregular tire wear. Often, specific tires for the job will be well worth the price in the mileage and replacement costs they save you. 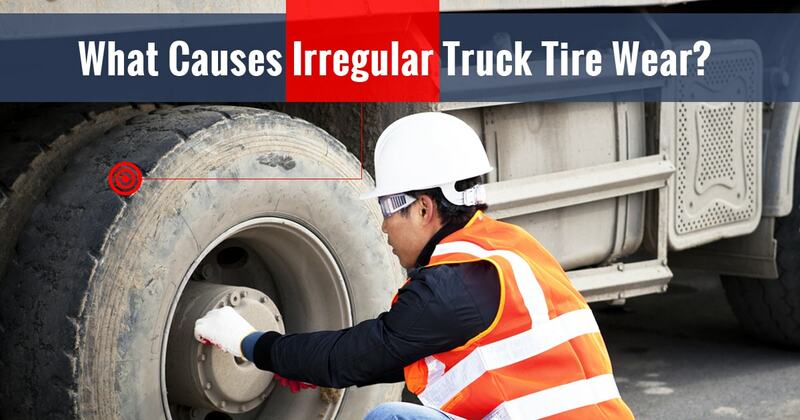 Improper inflation is the biggest cause of irregular wear on truck tires. An underinflated truck tire will wear quickly on the shoulders and, in extreme cases, weaken the tire sidewalls. Underinflated tires will also decrease your mileage, so it’s important to add air to get them up to the proper inflation quickly. Overinflating, while not quite as common, will also lead to irregular wear, in this case in the center of the tire. If you notice your tires balding in the middle, you likely need to let out some air. Make sure that you check your commercial tires’ inflation regularly to avoid driving with improper inflation. You often can’t help it if a nail, piece of glass, gravel, or other object from the road ends up embedded in your truck’s tires. However, dealing with these objects quickly can minimize damage. Make sure that you check your truck’s tires often, then remove any foreign objects before they have a chance to dig deeper into the tire. If there’s already a puncture, have it sealed, and you may be able to repair the tire before a flat occurs. Improper alignment can cause a number of problems for your truck, and irregular tire wear is one of them. If you notice that your truck tires are wearing down on just one side, misalignment may be the culprit. If your alignment isn’t totally straight, your tires may be pointing inwards or outwards, placing extra pressure along the inside or outside of the tread. In this case, you’ll need to have your alignment examined by a mechanic, who can then adjust your axles and suspension to return your wheels to the proper even position. Truck mechanical problems can also make themselves known through uneven tire wear. A bent axle, damaged tie rod, worn out ball joint, broken suspension component, or loose wheel bearing can all affect your truck tires. Tire wear from mechanical issues may appear on one side of the tire or as unusual, spotty wear. If you can’t figure out another cause of irregular wear, there may be a mechanical problem behind it. A thorough truck inspection or diagnosis from a mechanic should be able to pinpoint the issue.